For all of us that watch Love and Hip Hop Atlanta we've seen countless number of times where singer K Michelle talks about getting physically abused in a previous relationship. To constantly hear and see a woman break down about something like this we can obviously see that it is a serious issue and something that she wants to change in today's society. To continue this message, K Michelle has teamed up with 'Saving Our Daughters' in her latest campaign for 'Violence Against Women'. 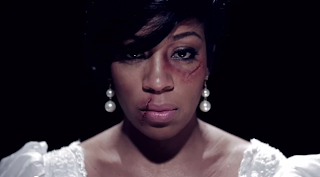 K Michelle is battered and bruised in this new video and I just hope she gets her message as far as hoped for. Not only does K Michelle star in a campaign video, but also her cast mate - Mimi Faust in a 'Hate Crimes Against Women' campaign. Watch both of their campaign videos below.